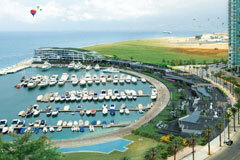 located at the Beirut Marina, with 17 restaurants & cafes, 5 boutiques and 2 activity centers to discover. Accessible to the general public, the upper and lower promenades form an intensely active area, where Lebanese, tourists and Beiruti lovers enjoy a wide selection of menus, as well as spaces for events, cultural festivals, concerts, exhibitions and a variety of other celebrations. Also the facilities under construction include an apartment and yacht club building. The pedestrian decks also include a promenade as well as outdoor resting areas, all accessible through Corniche level entrances with adjacent underground public parking facilities and valet services.